Keep up to date with your Client and Suppliers information using a CRM package! Looking for Microsoft Office software? Did you know that Microsoft will stop supporting XP on 8th April 2014? Now's the time to move on! Windows 7 & 8 - this is the new version of Windows. Windows 7 is still running but Windows 8 is also available should you choose to upgrade your system. Office 2013- has replaced the 2010 version. There are many types of packages available and include: Office Home, Business and Office Professional. Server Software - we can supply whatever your business needs and common ones include: Microsoft Exchange Server, SQL, Small Business Edition 2011 and now Small Business Server 2012. 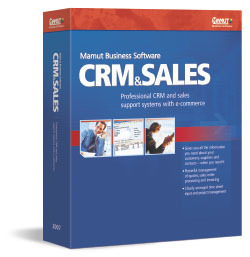 Customer Relationship Management packages (CRM) - eg Microsoft Dynamics CRM and Mamut business software. These enable you to keep your Customer data at your fingertips and can also be used to track buying trends and sales information. Back-Up Software - we are partners with Mozy Pro - who are providers of secure online external back-up solutions. We can install a piece of software onto your PC or Server which will allow automatic back-ups to be done to external server. Accounting Software - We are Partners with Mamut Business Software. This products give you real time accounts functionality, stock records, job costing, EPOS Bar Code automation and CRM. They are available as a single user or multi user package. They can be used on multi-sites and can be accesses remotely. Anti-Virus Software - We are Partners with ESET, who are a fast and ever growing company in finding new solutions to fight virus attacks and to keep your companys' data safe.